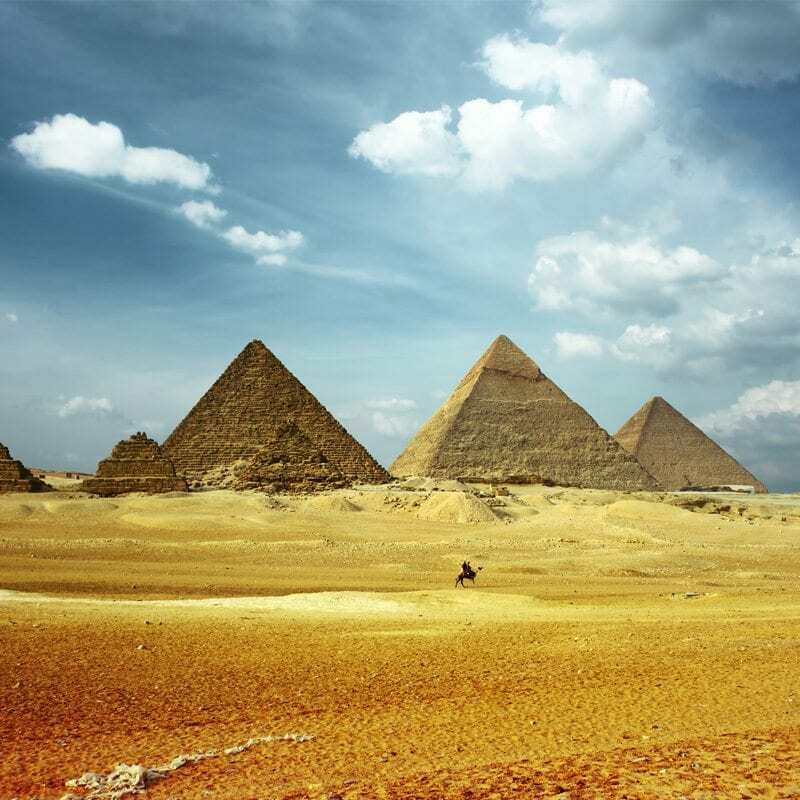 Marvel at the wonders of Jordan and Egypt, starting in Jordan’s capital Amman. 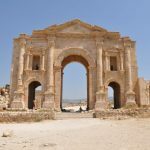 Explore Jordan’s rich history including visiting the ruins of Jerash and Ajloun, staying overnight in a desert camp in Wadi Rum, and floating in the Dead Sea. 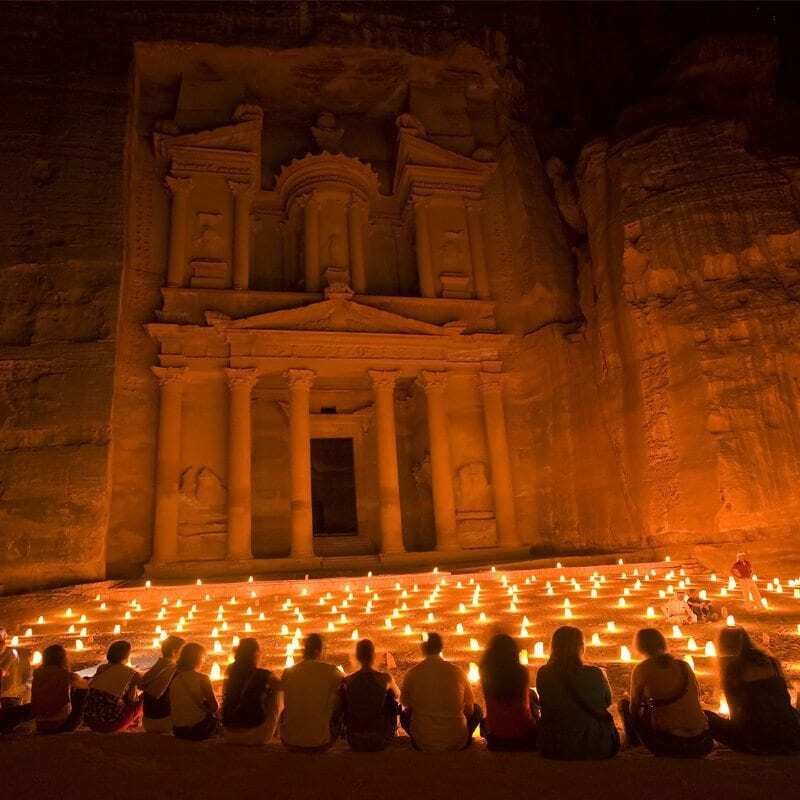 Be awestruck by the national symbol of Jordan, the city of the Petra before heading to Egypt. 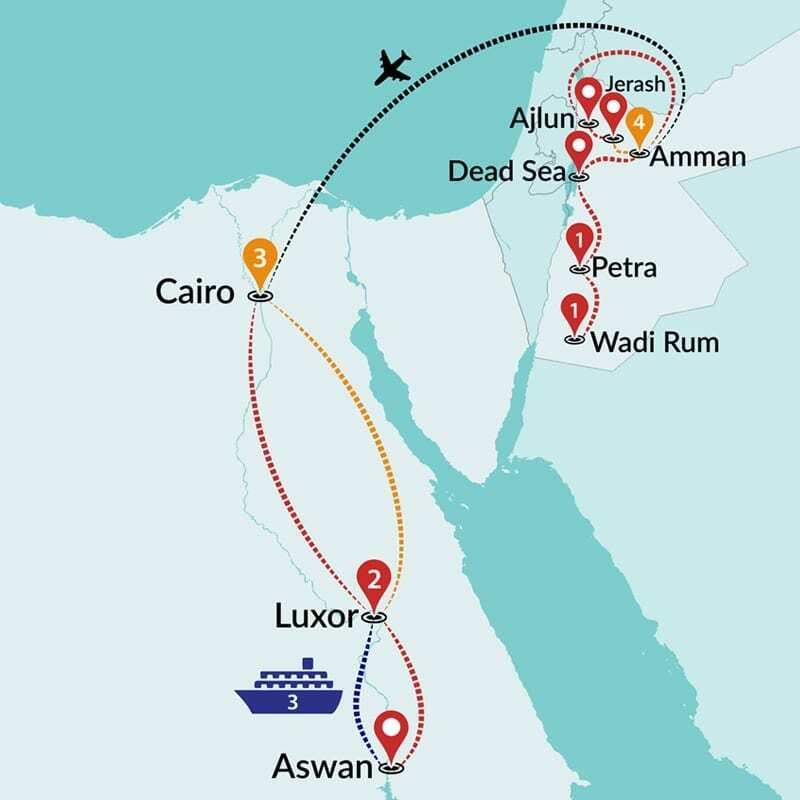 Cruise along the Nile from Aswan to Luxor in a 5 star Nile Cruiser. 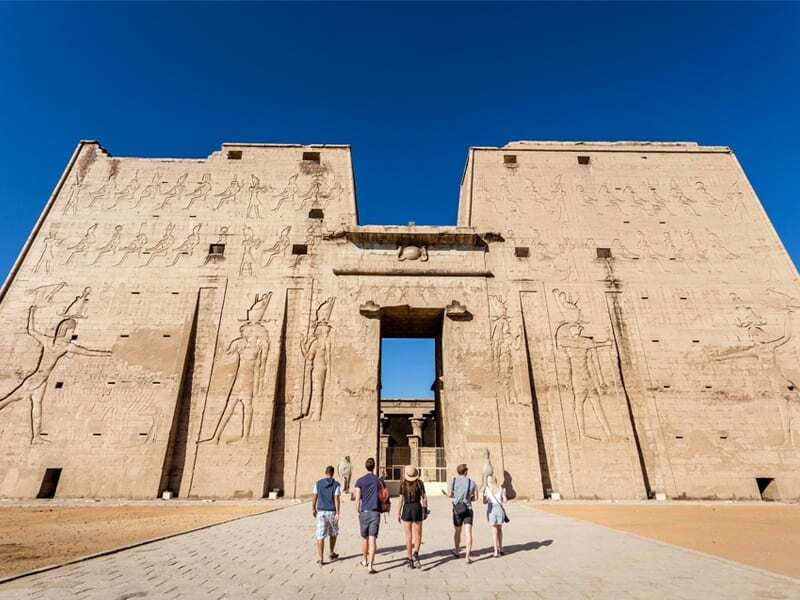 Soak up the Egyptian history as we discover the Pyramids of Giza, Temple of Edfu, Valley of the Kings and Abu Simbel. Attention: From the 30th October to the 1st of May winter itinerary will be applied. 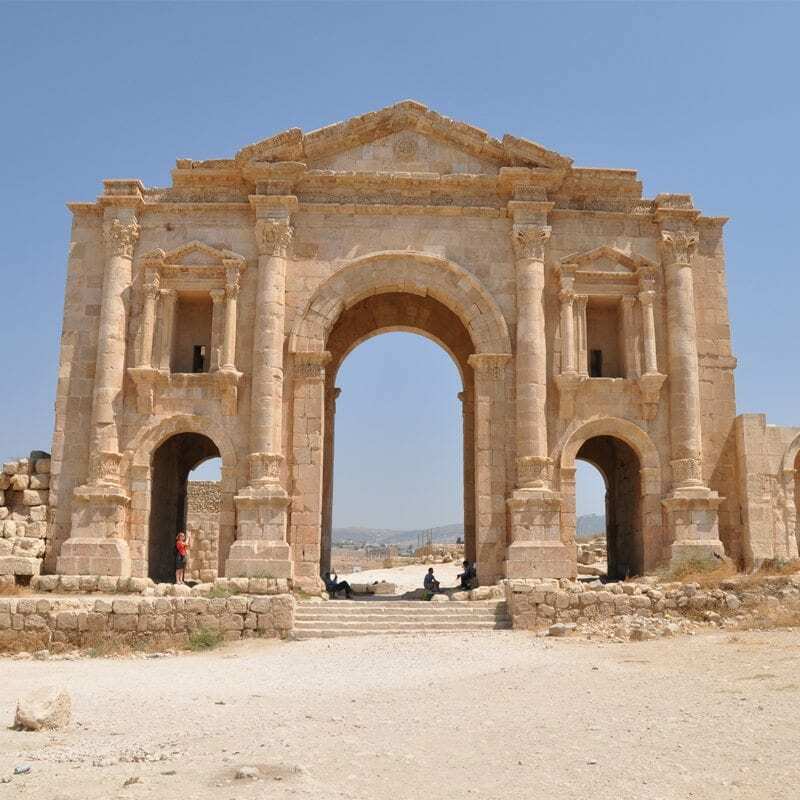 The modern and ancient capital of Jordan is one of the oldest inhabited cities. The city's modern buildings blend amazingly with the remnants of ancient civilizations. 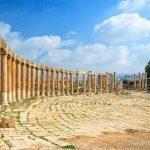 With a 30 minute drive from Amman you reach this unique spot in Jordan. Dead Sea brings a sense of unreality to any traveler passing through. 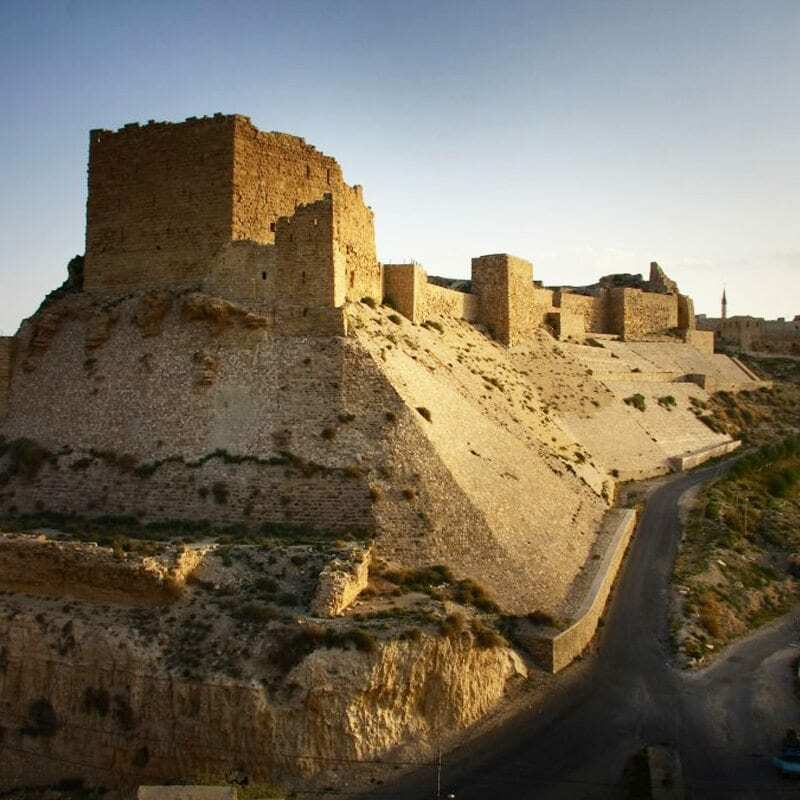 Less than an hour drive from Amman takes you 2000 years back in time. 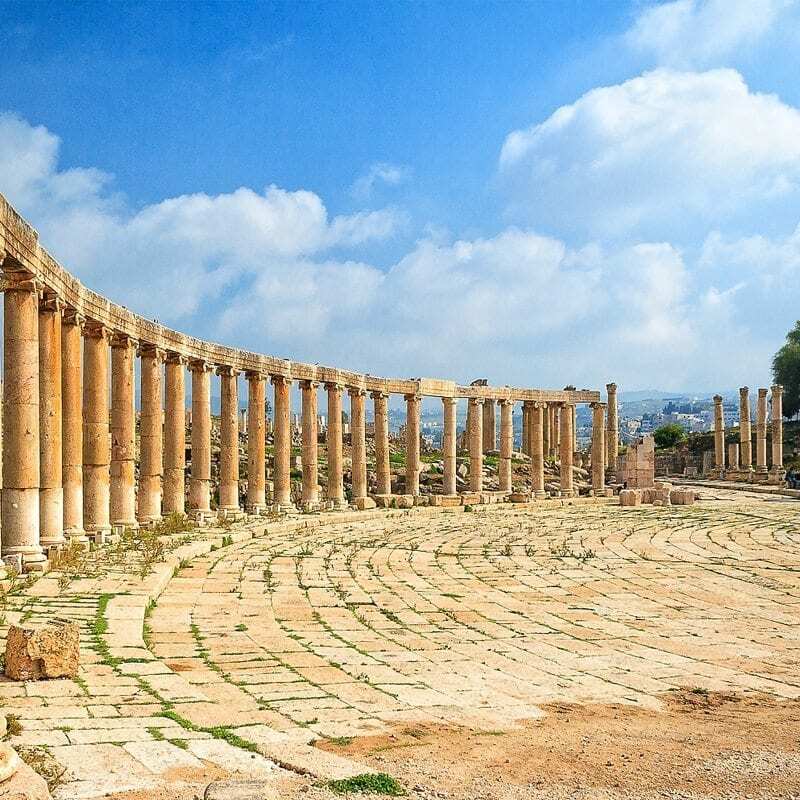 Jerash hosts the best preserved sites of Roman architecture in the world outside of Italy. Kom Ombo means ‘hill of the gold’ crowned with Temple of Komombo. The temple is unusual as one side is dedicated to the god Haroesis and the other side to Sobek. 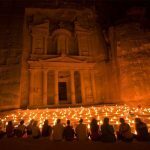 Petra, a UNESCO World Heritage Site, is described as ‘one of the most precious cultural properties of mankind's cultural heritage'. Simply amazing. Absolutely stunning in its natural beauty, Wadi Rum summarizes the romance of the desert. You may meet some friendly Bedouins living close by at the desert. At the Amman terminal keep your eyes open for the Travel Talk sign. 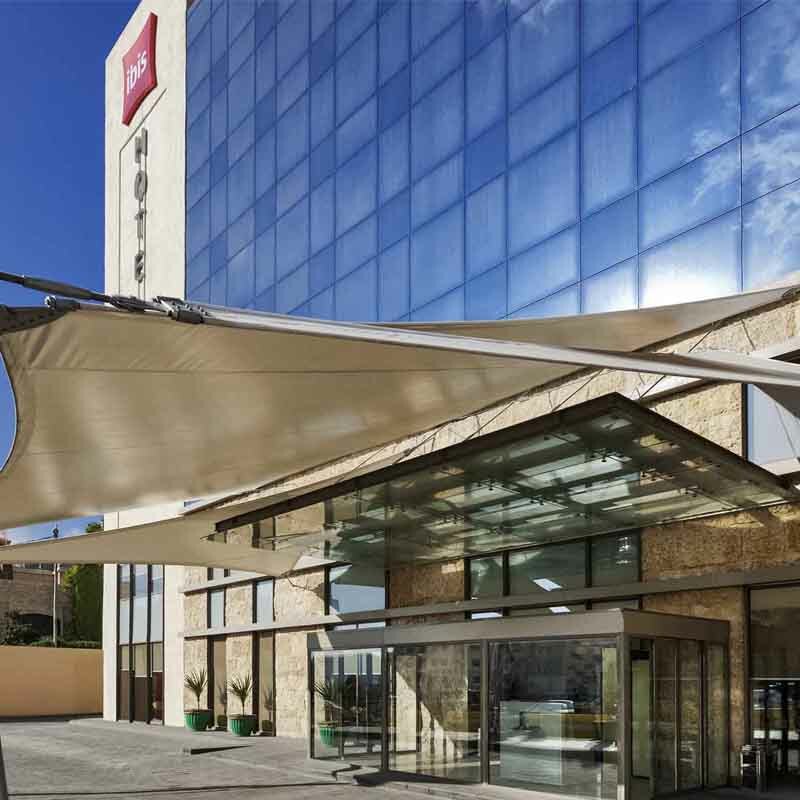 Gather round in the hotel lobby at 6:00pm as we meet both the other tour members and the guide for an informal meeting. 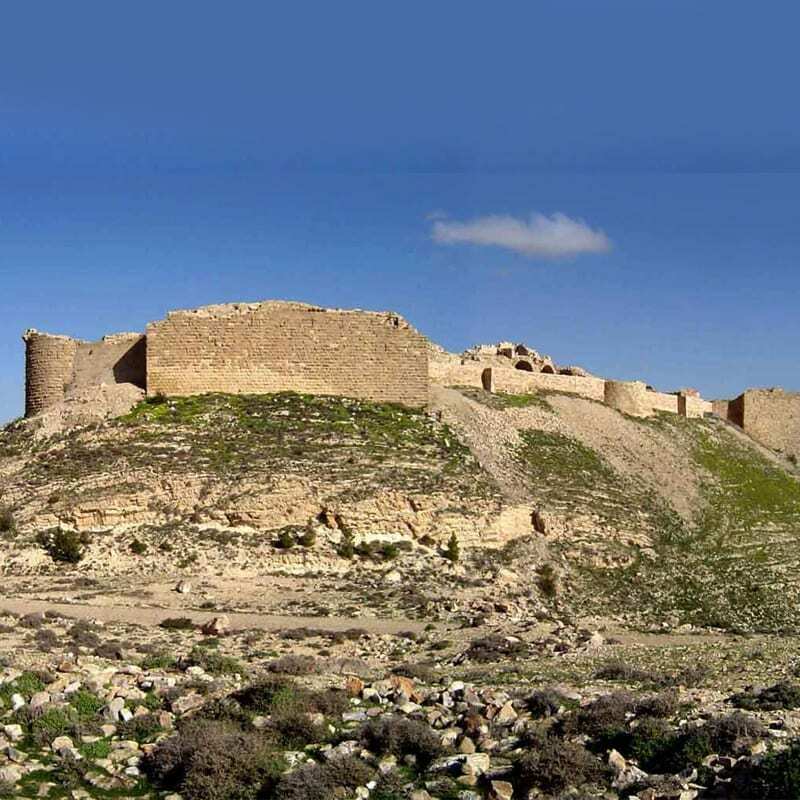 After breakfast we depart for Ajlun Castle and impressive Jerash which is a Greco-Roman ruined city. 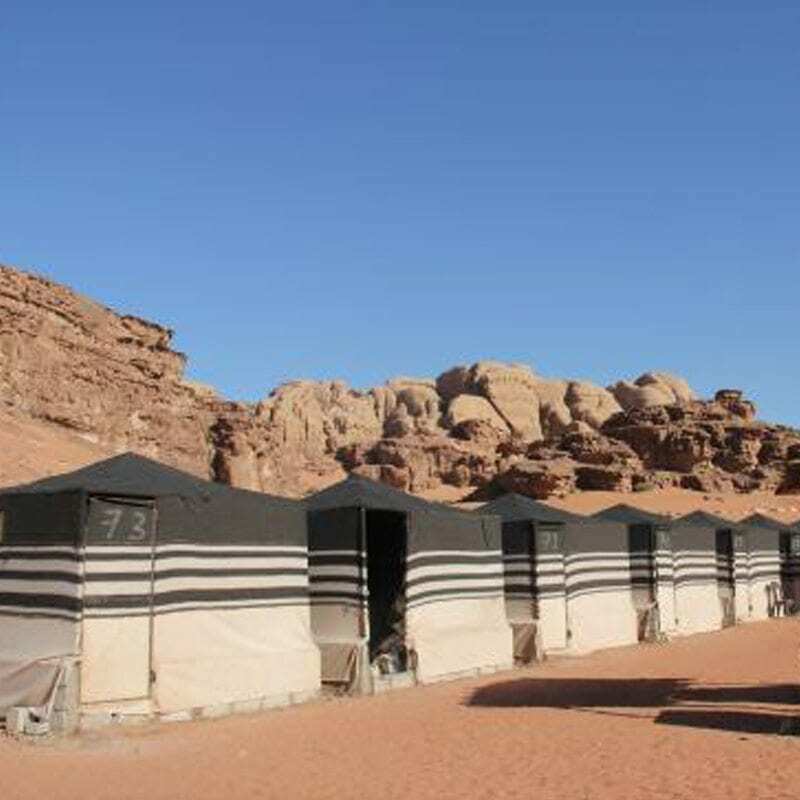 Today we depart for Wadi Rum to check in our camp site.Then we will join jeep safari in the desert.This evening we also enjoy an authentic Jordanian dinner in Wadi Rum. After chilling out by the desert fire and sharing experiences with our travel mates under a starry sky, we spend the night in our desert camp. After breakfast we depart for a full day tour in the Red Rose City Petra. Our local guide will provide us with a brief history of the city, which is one of the greatest attractions in the Middle East. 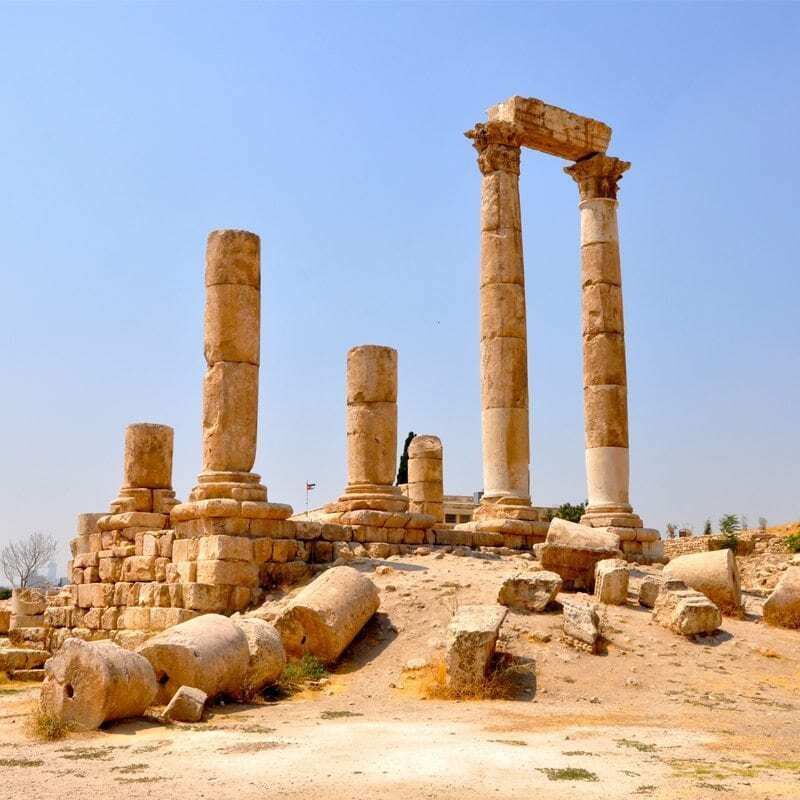 After breakfast we will join Amman city tour.In the afternoon you have free time to explore this magical city by your own. After breakfast, transfer to airport and fly to Cairo. After our breakfast, we depart for the West Bank of the Nile where our donkey awaits to take us into the Valley of the Kings. Next is our discovery of the magnificent “city of the Dead” where tombs were carved into the desert rocks, decorated richly, and filled with treasures for the Pharaoh afterlife. Rising out of the desert plain in a series of terraces, the Temple of Queen Hatshepsut is our next stop. 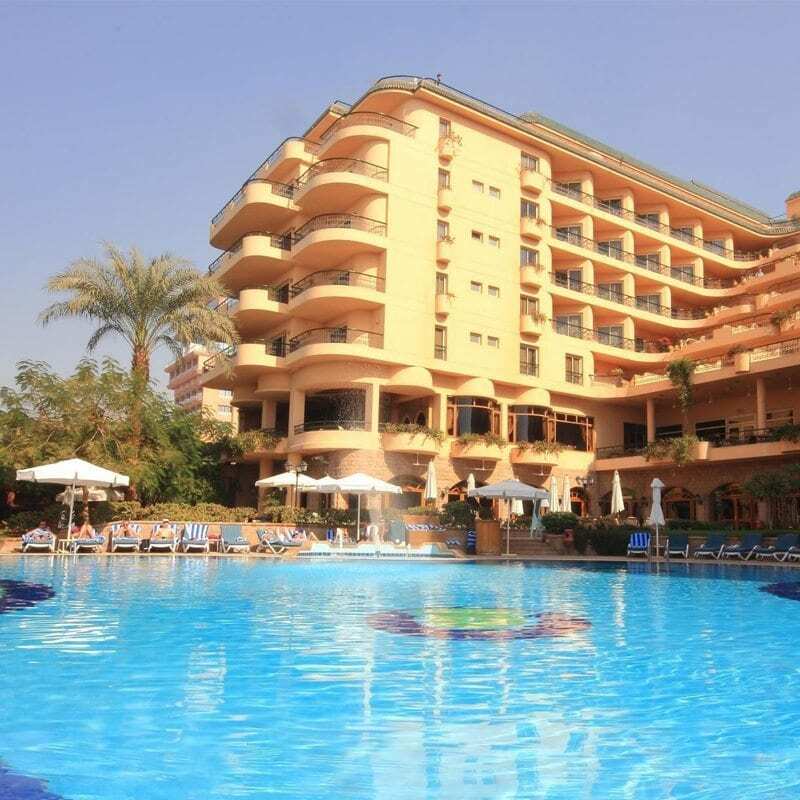 Then we drive to Aswan for overnight stay. After breakfast we explore Aswan, the smallest of the three major tourist cities based on the Nile, famous for the amazing Philea Temple and High Dam, an engineering miracle when it was built in the 1960s. After visiting the High Dam we head to Philea Temple and take a short motorboat ride to reach the island. 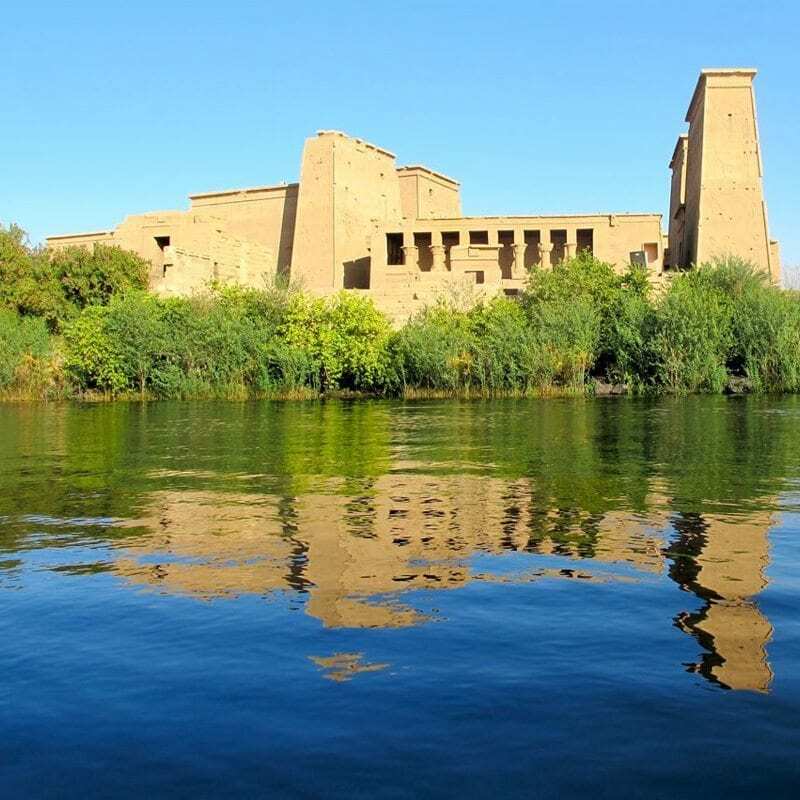 Dedicated to the goddess Isis, Philae Temple has a beautiful setting on an island in the River of Nile. 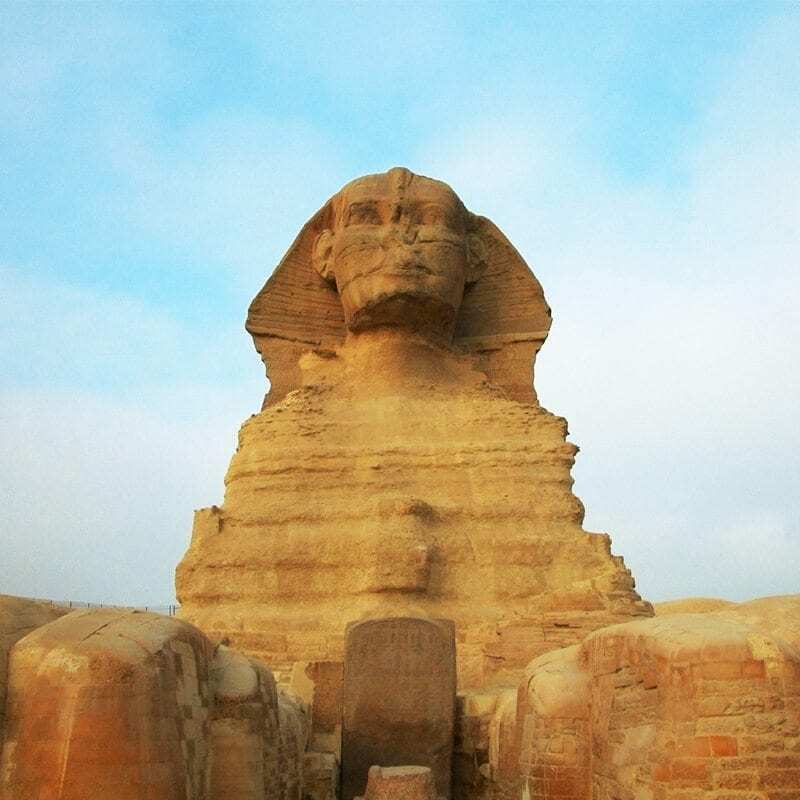 Its various shrines and sanctuaries celebrate the deities involved in the myth of Isis and Osiris. 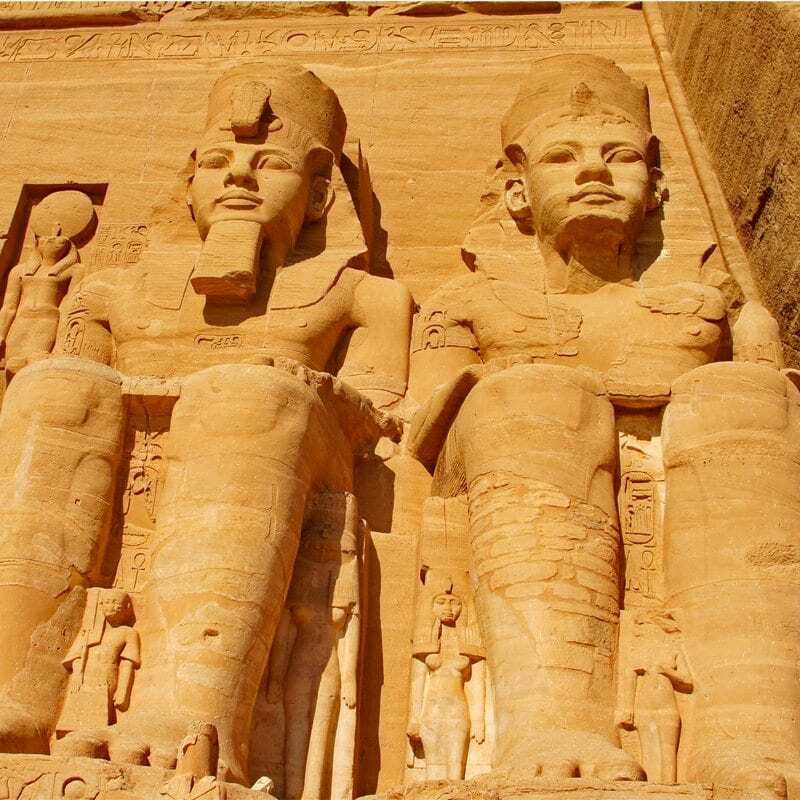 Early in the morning you can join the optional trip to Abu Simbel, one of the most impressive ancient sights of Egypt. 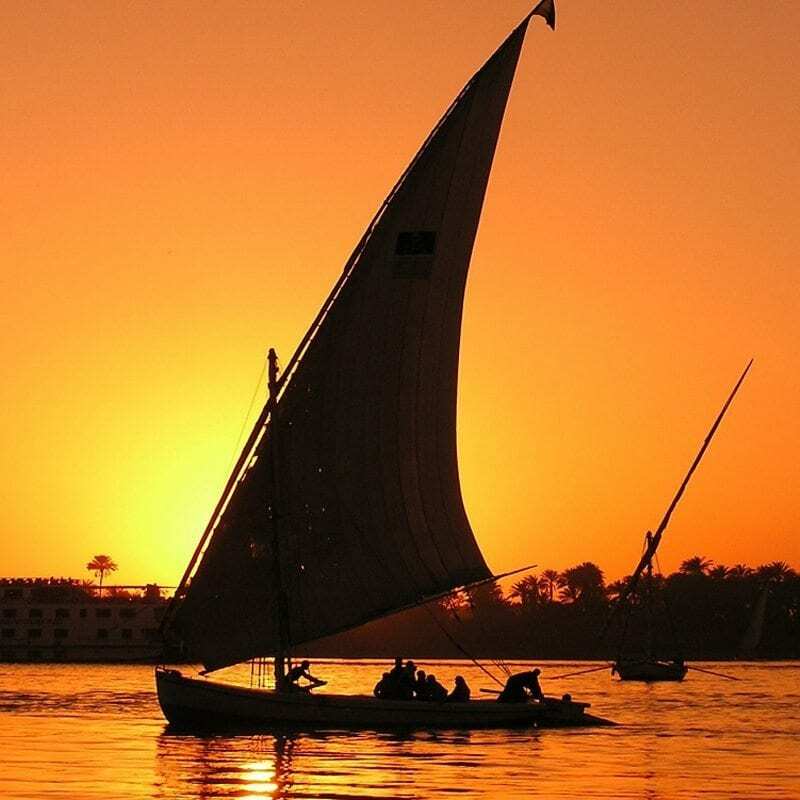 Later in the afternoon, we embark the 5 star Nile Cruiser to cruise along the Nile. Today we disembark Nile Cruiser. 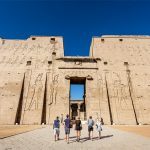 On our way to Luxor where we will spend the night, we head to Edfu to visit the largest and best preserved temple in Egypt. 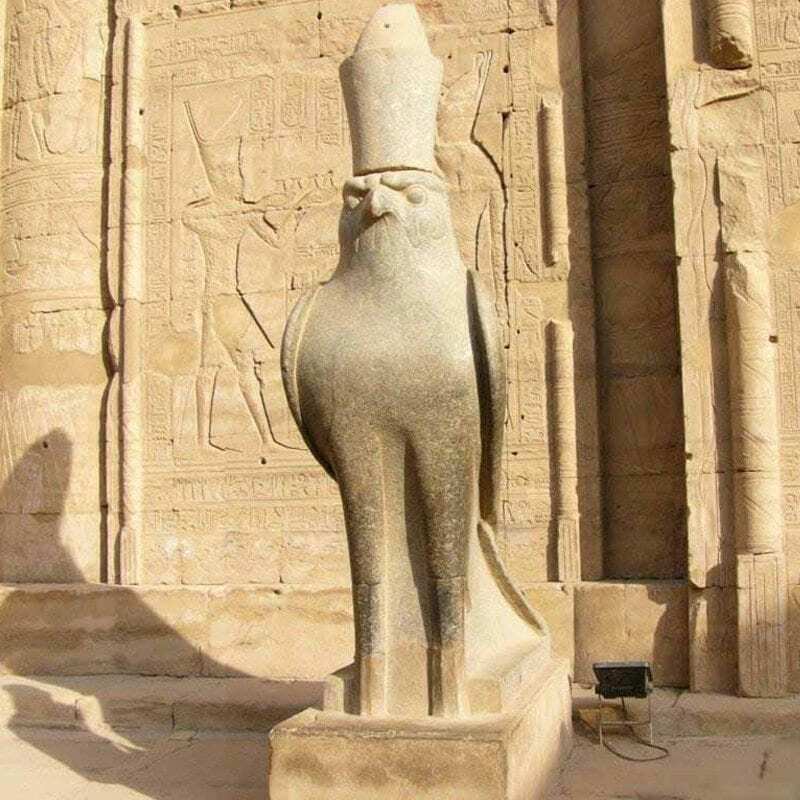 The temple is dedicated to the falcon god Horus and was built over a 180-year period from 237 BC to 57 BC. Then we continue to visit Komombo Temple which was built during the Ptolemaic and Roman periods. 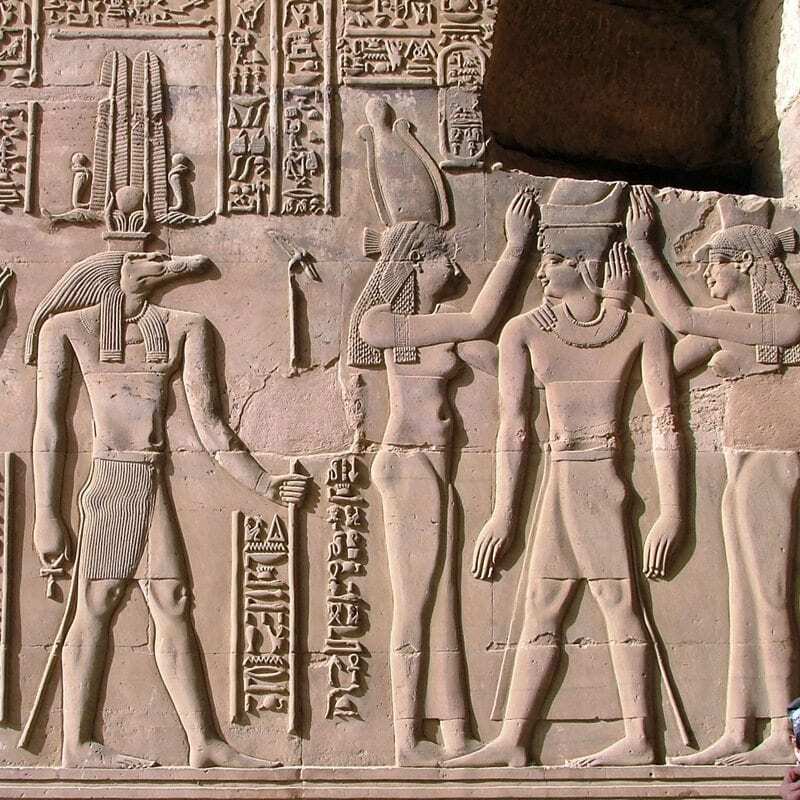 The temple is dedicated to the crocodile god Sobek and god Horus. 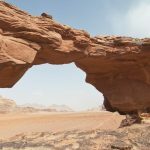 Today, it has much to offer the traveller, from vast temples, to ancient royal tombs, via spectacular desert and river scenery. 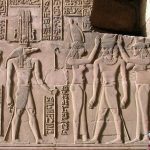 we visit the temple of Luxor on the East Bank of the Nile which was dedicated to the great god Amun, his wife Mut and their son Khonsu (the mood god), representing the Theban triad. 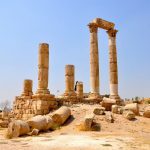 The temple was built on the site of a probably smaller structure for the god Amun, while the earliest parts of the temple seen today date from the 14th century BC and the time of Amenhotep III. In the afternoon we proceed to the Temple of Karnak, one of the most important religious centers of ancient Egypt. In the afternoon we drive to Cairo for overnight stay. Our trip will end after we say goodbye to our new friends over breakfast, and check-out of the hotel in Cairo (11:00am). Before your flight we bus you back to the airport and bid you safe travels. + £230 Local Payment The local payment is simply a portion of the total tour cost, that is due when you join the tour on the 1st day. It is created to ease budgeting for your holiday. 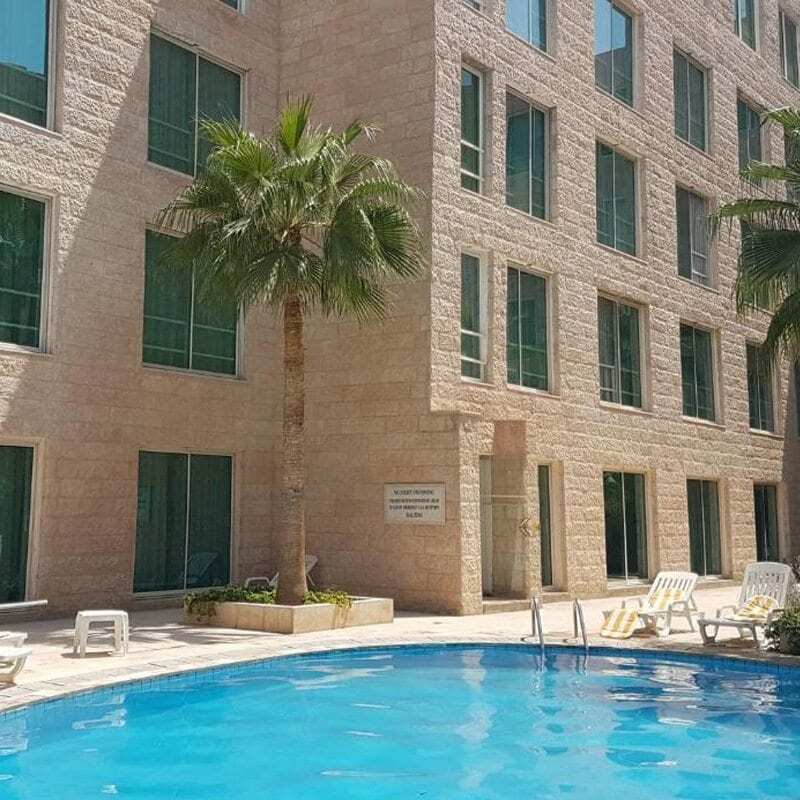 It does not cover any specific costs that are not listed under inclusions. 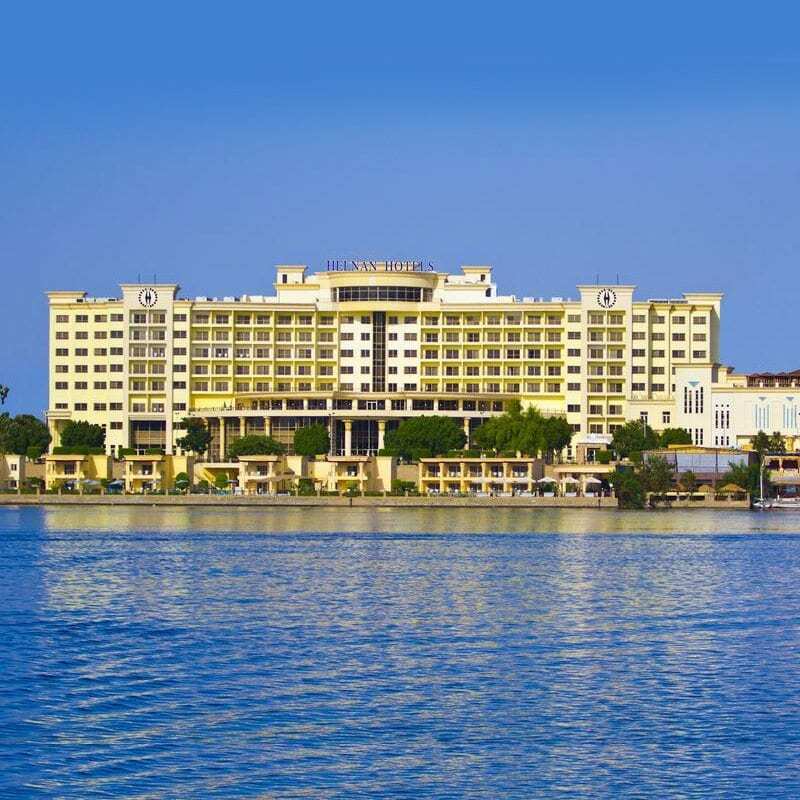 From the Airport to Travel Talk hotel on day 1 and departure transfer on last day of the tour. 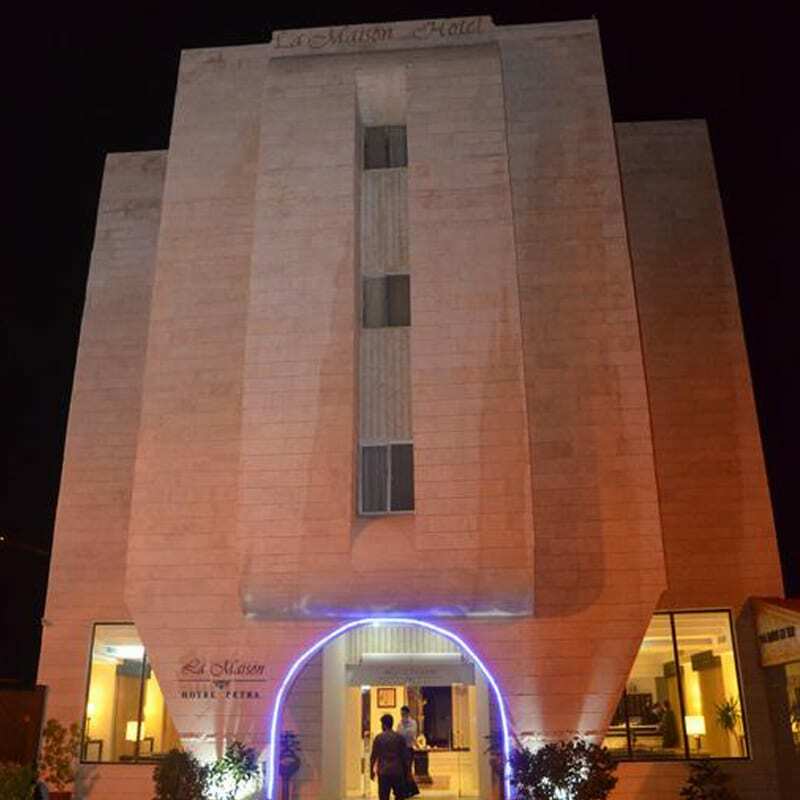 This hotel is only 30 min driver from the airport, perfectly designed for a comfortable stay experience with it’s sound-proof rooms.3 km away from the Amman Castle. 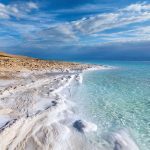 At Travel Talk we do not only provide excellent value for premium adventures, but also strive to exceed expectations in every aspect of our trips, which is reflected in an enviable 98.9% customer satisfaction. We believe that our affordable tours, quality accommodation, transportation and sightseeing tours combined with likeminded people, passionate tour leaders and the overall atmosphere of a Travel Talk tour have made these results. However, we are never ones to rest on our laurels, and we continually try to improve on this year after year; and what do we get out of this? The satisfaction of our travellers!